Let me preface this by saying I love Ron Santo. He's a Cub legend and a being a Type I diabetic myself a personal hero of mine. That being said, it's become increasingly obvious that the time has come for Ron to step down from the Cubs radio broadcast booth. 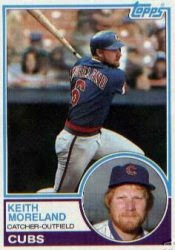 In his current absence, Keith Moreland has filled in brilliantly as color analyst alongside play by play man Pat Hughes. He's given us good insight and analysis and compliments Pat nicely explaining various plays and calls on the field. Essentially he's doing his job as a color man, something that Ron has sadly stopped doing. Don't get me wrong. I found Ron's homerism and heart on his sleeve attitude endearing, but it's reached a point where there's nothing of value being added to the broadcast. It's become a distraction to listeners trying to follow Pat's play by play. Bad Kermit at HJE posted yesterday his approval of Moreland to take over Ron's spot in the booth. Today TMS is offering their endorsement* as well. Make Keith a full-time fixture on the radio. *TMS still maintains neutrality in the ongoing Cubs of Yore Battle Royale. This endorsement of Mr. Moreland does not count towards that, unless of course he was battling against Mark DeRosa.